Merida is the largest city in the Yucatan peninsula and we venture there at least once during our stay. This time we had another reason to go: we were invited to stay a few days at a beautiful hacienda south of Merida and we combined that stay with a couple of nights in Merida. There are a lot of beautiful places to stay at in Merida and I had an opportunity to book a room at a restored colonial mansion aptly named Mansion Merida on the Park located right in the center of town. We booked the Palazzo suite on the second floor and were looking forward to experience life as it used to be, at least when it comes to architecture and decor. 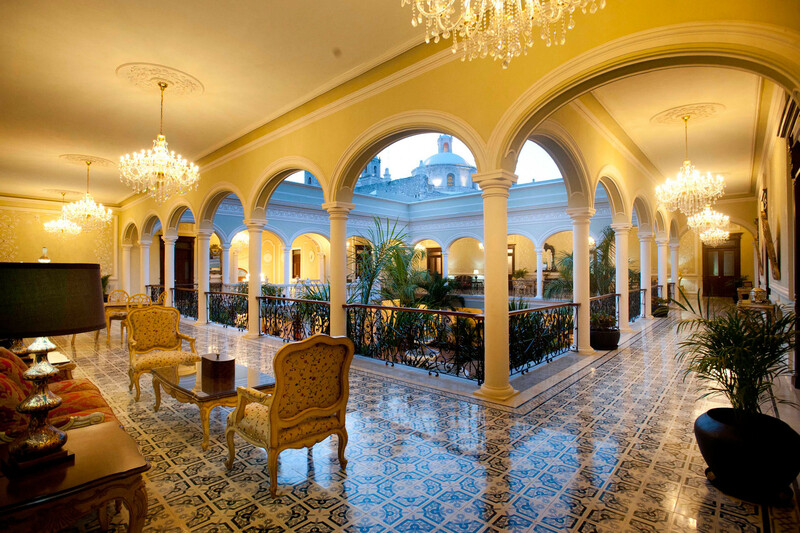 Merida Mansion on the Park is a 19th century mansion that has been renovated in the French architecture and decoration style of the time; It has 14 suites, a restaurant and all hotel amenities expected in this calibre establishment. The road from the coast to Merida is a very comfortable divided toll highway and within easy 4 hours we arrived at the hotel. There is no onsite parking and the hotel entrance is on the park, not on the street, so we pulled over on the street near the entrance and our car was parked for us by the concierge. The Palazzo suite was elegant and large with very high ceiling, large bathroom, a sitting area and all of the conveniences that you would expect from a hotel of this standard. Two large sets of doors opened onto two small balconies over calle 59 bit we kept those closed s there was no particular view. The two large main doors opened onto the second floor central porch and since it was not overly busy we could leave them open and extend our space. One of the most beautiful features was the large chandelier hanging from the high ceiling and giving the room an elegant aura of time past. The covered porch looked over the inner courtyard on the ground level. It had comfortable sitting areas, tables and chairs that provided an extension of our room and since only second floor guests came up there, it was almost a private space. Since food is always on my mind we started with a light lunch at the hotel’s outdoor restaurant. We sat at a table under an umbrella at the edge of the Parque Hidalgo and ordered two small dishes: Panuchos and Papadzules. We enjoyed our lunch for a few minutes when rain begun to pour driving everyone but us indoors. We sat there alone for a long time with the relentless rain coming down all around us until we decided that this was not going to stop anytime soon so we ran indoors getting soaked in quick order, signed the bill and went to sit on the porch outside of our room and watch the rain over the center courtyard. It was quite beautiful and we enjoyed listening to the raindrops hit the floor tiles and splash around, refreshing everything and permeating the air with the fragrance that only rain can bring. Our dinner plans for the evening were special. I read about Nectar, a “destination” restaurant whose chef Roberto Solis worked with the chefs at three of the world’s most famous restaurants: Rene Redzepi’s Noma in Copenhagen, Heston Blumenthal’s molecular gastronomy restaurant the Fat Duck in London and Thomas Keller’s Per Se in NYC. Cooking under these world class chefs means something and I had to try out Nectar’s food. Nectar is a bit out of the way abot 20 minutes north of city center. I reserved a table in advance of our arrival but the only opening was for 6:00 pm. The restaurant is beautiful with warm ambiance and modern decor. It was early and not too busy yet (most guests begun to arrive at 8:00 pm). We were seated at a table in the dining room but my seat was a sofa and not very comfortable and besides, I wanted to see the kitchen so we asked to sit at the long counter overlooking the kitchen and were soon moved to where we were very happy to sit and observe the going on. The kitchen is fairly small and immaculate. The four or so chefs that were cooking that evening constantly wiped and cleaned and everything glistened. We had front row seat for a kitchen show that I will not soon forget. We ordered a couple of appetizers to begin with, both to share. One was the famous black onions that consist of onions petals injected with xcatic pepper mayonnaise, then dipped in black tempura batter and deep fried in front of or eyes just before serving. The plating was exceptional, setting the hip of blackened onions against a piece of charcoal. It looked like a pile of charcoals or lava rocks on the plate. I could have made an entire dinner out of these onions. The crisp outer layer, soft interior, oozing hot mayonnaise were so delicious I was sorry we only had one order to share. We also shared an eggplant dish they called Eggplant in Textures, made of baked and pickled eggplants with brie and chickpeas. With that we were served freshly made (right in front of us) Indian bread served in a canvas envelope similar to a tortilla warming case.This was good but after the black onions it was more difficult to be impressed. Dinner was special with unique flavours and variety of textures. My dish was white fish with citrics, veil of tamarind, jamaica gel and peanuts and had nuances of sweet, savoury, tangy, soft and crunchy in almost every bite. The plate came with the fish on it and the server poured the sauce over it at the table (counter in our case). My husband had the lamb, soft and tender, served with peppermint and yogurt sauce, eggplant and sauteed mushrooms. All the courses displayed a discipline in quantities and presentation inspired by Japanese cuisine. Desserts were extraordinary: a chocolate presentation made with very light cake, chocolate ice cream, chocolate foam and a surprise bite of popcorn ice cream. My dessert consisted of frozen honeycomb with honey ice cream, yuca foam and a few other textures. I don’t know how but I have to make something like this when I get back to my kitchen at home. For my palate it was one of the best desserts I remember. Other desserts on the menu included chocolate tamale, tres leches, creme brulee and a couple of others. The pastry chef was working at the back behind a glass window separating him from the heat of the kitchen. We watched him cut a huge slab of butter into manageable 1 lb sticks, wrapping each individually in plastic for storage. We lingered long after dinner as the restaurant was beginning to fill up with later diners and the atmosphere was changing to higher energy. Eventually we left but will go back at the first opportunity. Next post: Sunday festivities in Merida.